Getting to know Barcelona and its surroundings in a healthy and sustainable way is possible. By just renting your bike in our apartments in Barcelona, you will have cycling lanes, roads and natural spaces at your disposal to travel at your own pace while pedaling away. There are options for all ages and difficulty levels, you just need to choose between the best cycling routes in Barcelona to spend a different day while enjoying the scenery you are going past. If you are looking for the best urban routes to travel through the city without traffic or pedestrians getting in your way, we recommend the following guide so that you can take advantage of the many landmarks of Barcelona along the way. It begins in plaza de Colom, where the statue of the famous discoverer is located. From here you can take the route along passeig de Colom bike lane in a northerly direction. Divert to the right when you get to Roy Lichtenstein’s famous statue, called «Face of Barcelona». From this point you can discover Barceloneta, the old fishing district of the city. Go on the cycling lane on carrer del Comte de Barceloneta and, when you reach the top, turn left to start your route along the beaches, beginning at Sant Miquel. Once you have crossed the Somorrostro beach, you will have to surround the Olympic Port, following in the direction of Nova Icària beach. After passing through Bogatell, Mar Bella and Nova Mar Bella, all of them in the Poblenou neighborhood, you will find Llevant beach and the Forum. Here you have the option of taking the route back and dine in a restaurant with sea views in Barceloneta or continue on the ronda Verda until you cross the Besós river and reach the neighboring city of Badalona. -Time: 1 h 30 min. How would you like to see most of the city’s monuments in the same day? This is the idea of one of the best cycling routes in Barcelona to see the best-known places in the city. Start in Plaça Catalunya, from where you will go up passeig de Gràcia to see the facades of some of the most famous modernist houses, among which we find Casa Amatller, Casa Batlló or La Pedrera; these last two being works by Gaudí. When you reach the intersection with avinguda Diagonal, take the bike lane that goes to the left and go straight until you reach passeig de Sant Joan. Turn right on this street until the next street. In carrer de Provença, advance three blocks to reach the Sagrada Familia, the most visited monument in Barcelona. Go down carrer de la Marina until you reach the Ciutadella park, where you can rest for a while if you want. Then, go up avinguda de Lluís Companys towards Arc de Triomf and straight up to plaça de Tetuan, turn left on Gran Vía until you join passeig de Gràcia again. You can finish the route here or go down plaça de Catalunya and Les Rambles, although it is not recommended because there is no bike lane, even though there is a cycle path, as the volume of pedestrians can be a problem. Instead of this, it is preferable to take a themed route around the area to get to know it better. This is an urban route that, in addition to transporting you to the most glorious days of Barcelona, will allow you to breathe fresh air in one of the most well-known corners of the city. Start your route in passeig de Josep Carner and take the ronda Verda, which you will find next to the fire station. Cycle up to the Mossèn Costa i Llobera gardens and admire both the views and the beautiful plants you will find. Go to the Miramar cable car and continue straight on the avenue of the same name. 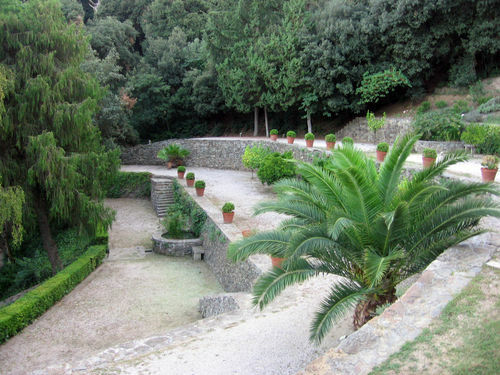 Just before reaching Plaça Dante, on the other side of the pool, you will find a path that climbs through the gardens of Joan Brossa, another of the hidden gems of this mountain. Follow this bike route through Barcelona to the plaça de la Sardana and turn right to the Mirador de l’Alcalde, a perfect opportunity to take a selfie with the Mediterranean in the background. Keep going up to the Montjuïc castle (bear in mind that there is a height difference of 154.2 fee (47 meters), where you can stop to visit the old military fortress or follow the path. Be that as it may, continue skirting the castle to the Caseta del Migdia, where you will find one of the terraces with the best views of Barcelona, perfect to give yourself a good reward. If you want to complete the route, go down to the Olympic Stadium, passing through Poble Espanyol and ending at Plaça d’Espanya. Now that we have reviewed the best urban getaways in the city, we will review other cycling routes in Barcelona and its surroundings that will take you along the most suggestive roads. Les Aigües road is in the surroundings of the Collserola Natural Park, the mountain that protects Barcelona from the northwest. To get to this starting point, you should go to the Penitents merto stop or take the 196 bus to the Tibidabo funicular. There, you must surround it via carrer de Manuel Arnús. At this point you will find kilometer 0 of this bike route, that starts at Les Aigües parking, which you can also do as a hiking route if you prefer. From here, you can start pedaling and explore Barcelona from end to end from a very different perspective than you may be used to. Follow carretera de Les Aigües, surrounded by pine trees and oaks to the Font de la Mandra, in the Pedralbes district. Along the way, you will find several viewpoints to admire the great views such as the Mirador dels Xiprers. 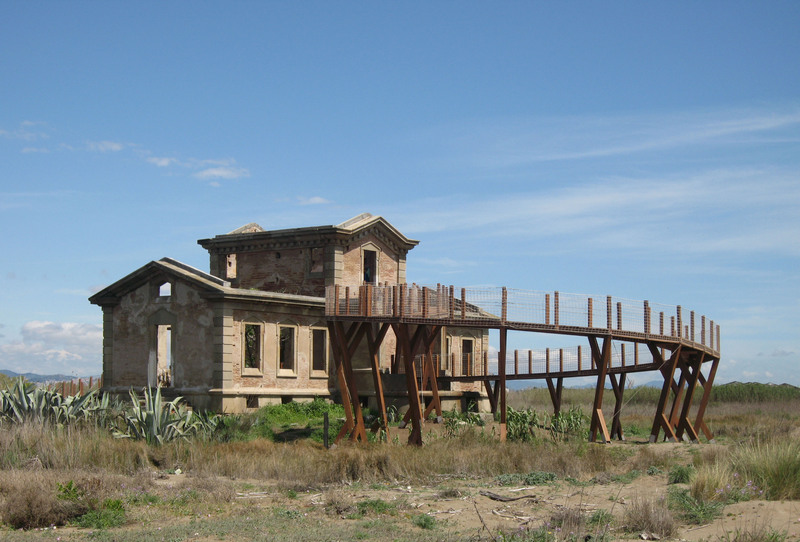 Towards the end of the route, you also have the option of going up to Sant Pere Màrtir, where you will find an anti-aircraft battery from the Civil War, a perfect place to have a picnic after your route. If you want a road cycling route for the whole day that offers unparalleled views, we recommend you visit the Garraf region of Barcelona, known for its coast and its winding roads. Start your route with a road bike in the town of Garraf, where you will join the C-31, the road from Barcelona to Calafell. Following the road, you will pass by beaches such as Cala Morisca and Cala Vallcarca. As soon as you arrive in Sitges, take a detour in the Levantina urbanization to head towards Aiguadolç and cross the beautiful town through its center. Follow its promenade to the passeig del Doctor Gaietà Brenapres and continue your route through the passeig de Vilanova. From here you will join the C-426-A until Ronda d’Europa and you will deviate to the right to return to the coast in Vilanova i la Geltrú. Take the C-426-A again passing through the Racó de Santa Llúcia and up to Cubelles, where you can follow avinguda de la Riera de Foix and end your route in the beautiful Foix Natural Park. If none of these options satisfies you and want a real challenge, we propose this route with a high slope and 49 kilometers in length. The best part? The incredible place where you will finish pedaling. Start your bike route in Olesa de Montserrat, taking Carretera de la Puda or C-55 to Monistrol, at which point you will cross the Llobregat river and continue along the same road, pedaling through the sharp curves and with the shadow of the magical mountain in the background. Along the way, you should go through Castellbell, Marganell and el Vilar. The road will take you to deviate along the GR4, until you reach one of the less known places to visit in Montserrat, the Monastery of Santa Cecília. You can rest for a while here and continue your route to the monumental complex of Montserrat. Pay the Moreneta a visit and take the opportunity to eat something before going down again on the same route. Forget about roads and breathe fresh air thanks to these beautiful nature cycling routes in Barcelona and its surroundings. Learn about the environment of the area, its flora and fauna, while practicing your favorite sport with the following proposals. If you would like to discover an ecosystem that you did not think existed near Barcelona, you can do this simple bike route. To get to this point, take the PR3 bus from L’Hospitalet de Llobregat. Going down at the South Cemetery / Tanatorio stop, you will have to pedal one kilometer until reaching the Mirador del Aeroport del Prat, a unique stop to see planes landing on the runway. Follow towards the viewpoint of Cal Lluquer, where you will have a first panoramic view of the Llobregat Delta from its viewpoint. Start pedaling until you reach the house of Los Carabineros and the Semáforo de la Playa, two buildings that warn us we are close to the mouth of the river. Go by the Estany de la Ricarda to the tower of the same name and go to El Prat beach. In this place you can cool off in a beach bar or stretch out on the beach to regain strength. Although this option does not have a cycling lane in itself, but cyclable routes (streets that allow cycling), it is one of the most beautiful routes in Barcelona, since you can enjoy an excursion around the most natural Barcelona and its spectacular views. Entering through carrer d’Aguilar, pedal among the pines of the parc del Guinardó and discover its secrets. When you decide to continue, head towards the viewpoint of plaça de la Mitja Lluna, the first of the stops that will offer you an unparalleled panoramic view of the city. From here take the Gran Vista road until you reach the Mare de Déu Sanctuary of Mont Carmel, where you will enter Carretera del Carmel to your left. Then you will take the path that you will find on your right, in the gardens of Juan Ponce, following the marked road until you reach the top, until you reach the famous Carmel bunkers and its views. When you want to keep moving forward, head down the slope of the same road, but, in the second curve, take the path that goes to the right instead of going straight. Thus, you can quickly enter the highest part of Park Güell, a perfect opportunity to see the famous creation by Gaudí. From here, if you want to follow the route you can go up to the Parc de la Creueta del Coll, although it is more complicated by bike. This route is considered of medium difficulty because of the unevenness you will find. 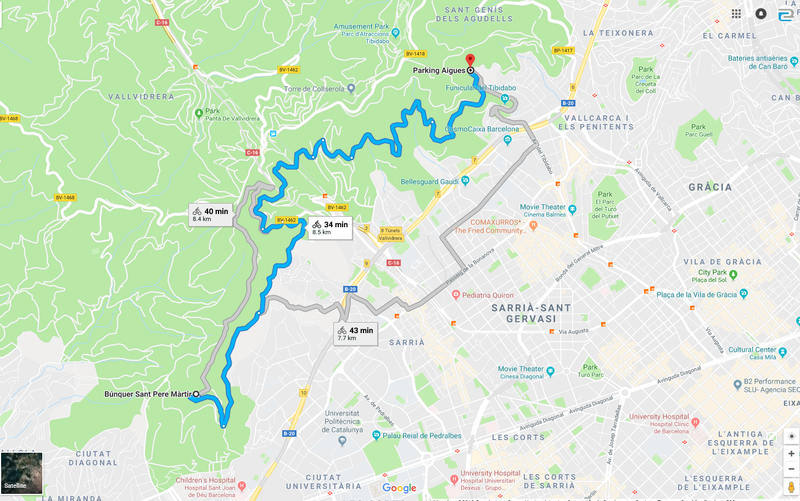 If you want an alternative to the Carretera de les Aigües, you can try this cycling route in Barcelona that will take you to the gardens of Can Borni, one of the little-known places in Barcelona. Head towards the Tibidabo cable car and take carrer d’Eduard Fontseré, which is on the left of the building. From here, you will join Carretera de les Aigües on your right for a while, until the second crossroads, where you will turn off towards carrer del Torrent de la Font del Mont. When you get to the crossroads, take the Vallvidrera road to Barcelona passing by the Mirador dels Bombers, surrounding the Tibidabo park and the Fabra observatory. Follow carretera de Can Borni and cycle up until you reach this beautiful enclave that was built on the Universal Exhibition of Barcelona in 1929. In the park you will find ideal spots for a picnic. Do you know other cycling routes in Barcelona? Leave a comment explaining it to other users or share your experience if you have tried any of them! 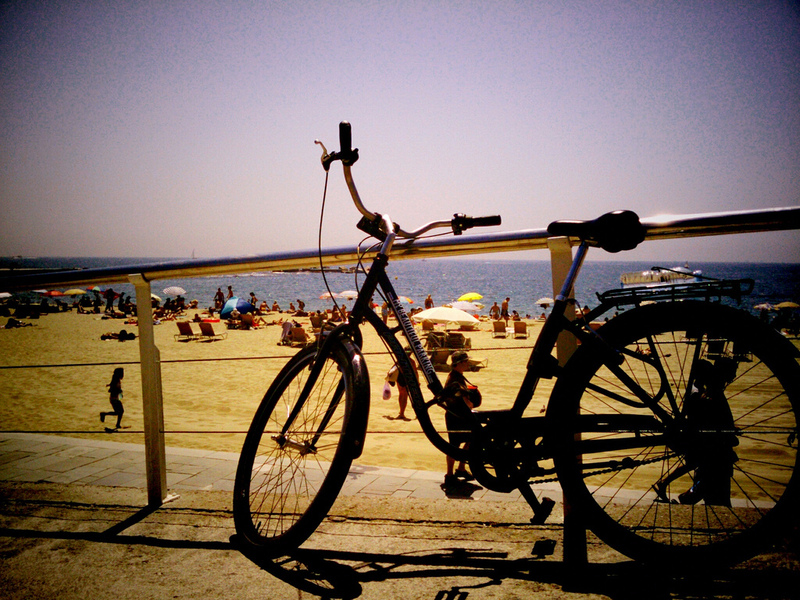 And remember that if you stay in our Barcelona apartments by the beach you can rent your bicycles right here.